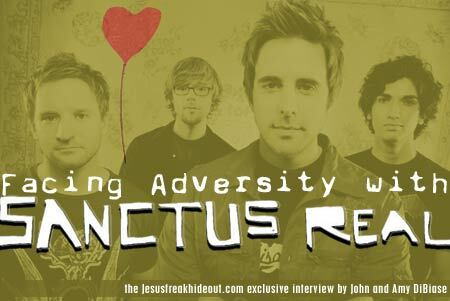 Jesus freak Hideout (John DiBiase): "I'm Not Alright," the song, is such a brutally honest song that stands out more because emotional honesty seems to be scarce in the Christian market and the Christian culture. What prompted you to make the bold leap to write this song and even put it first on the record? JFH (John): Tell us about the music video. What's the concept behind it? Chris Rohman: The music video this time around was a great experience. We tried to go as much all-out as we could, I guess you could say. We got a great director. Scott Spears was his name, and you're probably familiar with what he's done before. He's kind of a new guy, but he did the last Switchfoot video for "Stars." He's done other projects too. We were in California for the last leg of this tour. We were on The Face of Love Tour and we had two days between shows and we were in northern California. We drove all the way down to L.A. for a day and kind of drove out of town into the desert and shot it on Valentines Day. It was a twelve hour day in the middle of nowhere. It was cool. We had a great crew out there working on it. We got to shoot it on film this time. I think the look is kind of that timeless look. We were really happy with the performance on it and the way he captured it. The concept is really just following... If you've seen it you know two different people in different situations in these cars are kind of approaching this intersection that we're playing at and you don't really know where it's at. It could be anywhere you know. As they're speeding towards this intersection, they're just going about their lives. You can tell that maybe the guy isn't alright, he's got stuff on his mind. He's tired and he's worn out, and the girl is driving in just kind of her own world too. It's like these worlds kind of come together. They meet and they kind of collide there at night at that intersection. They see us there and it kind of diverts them from that collision course they were on and magically we're gone after they swerve out of the way. We just kind of wanted to tie in a different element than having it be a performance video and thought that was kind of a cool concept to be out at these crossroads route where things meet, so that's kind of the idea behind it. And we were really fortunate to squeeze in that music video because we only had that day to work on it. It was cool. JFH (John): With how rough this past years been was there a time when you guys were thinking about just quitting the band? Mark: Yeah I think during that time when I was off the road for two months just home with my dad and my new son while the guys kept touring. As Matt was saying earlier, we felt like the whole thing was kind of coming apart at the hinges. We didn't really know what was going on or where we were. I think we were all maintaining in the moment kind of thing. When that time passed and I rejoined the guys out on the road, there was still the weight of everything that just happened upon us. And we're going out there trying to play these shows every night and getting in front of kids and trying to have fun with them and trying to be that happy go lucky fun bunch of pop-rock guys that we've always been and it wasn't natural at all. Like, we had to force it. We were depressed. None of us felt like being out there. None of us felt like doing it. I remember one night in particular, Matt was in the hotel room and I think I was sharing a room with him that night and Chris happened to come in and he just kind of let a load out. Just kind of spilled his guts, and for the first time, I heard it come out of his mouth that "honestly, I feel like quitting. I just feel like just giving up. This is just too much." We talked through a bunch of stuff and there obviously weren't issues between any of us at all, just a matter of this is so much to deal with right now and so much pressure and there's no time to get anything done. And we felt that way a lot, but under those cirumstances, there's so much more than ever to have to bear. But after talking through and just praying... Honestly just a lot of just praying, and I think getting to that place where we were just honest and just saying, "God, alright, we don't have control anymore. You're gonna have to take it. We can't do this, you have to do it." Obviously God, I think, loves it when we get to that point. Not that He wants to see us suffer or have to go through what we have to go through to get to those points. His strength is always made perfect in our weaknesses and He's always... Yeah, that's when He's at His best when we are at our worst and that's when we can see it. Him working all things together for the good. So it was almost just a turn around point from that moment and when we got in the studio and started recording the record. And when that chorus of "I'm not alright..." came out and we were finally able to break through that barrier and again just be honest, it's like the whole record just kind of... It's like the flow finally turned on from there and the record just kind of came together. JFH (John): Can you tell us about the song "Benjamin"? It's definitely one of my favorite songs on the record and I kind of know the story behind it but I'd like to hear your side. You wrote it right? Matt: Yeah, I was gonna say that I'll never forget Mark calling me and saying, "Yeah we had Benjamin, and by the way, my dad died." I was like, "Oh, alright." Obviously none of us knew Mark's dad like Mark knew his dad. There's that certain security that I think we all had since we were teenagers. Our parents have always been so supportive of the band and they've always been there. And to find that out is awful. That night, I just remember I didn't know what else to do. I literally just picked up my guitar. I told my wife that I'm just gonna go into my room and just think and play my guitar. Out of that, literally that night, I wrote "Benjamin" almost front to back. The first verse is just about Mark, children, and the circle of life that we all experience. Children are born. Parents die. It's like we all experience that, you know? It's like Mark talking to his dad. If you can't talk, just cry, but we'll see each other on the other side. The second verse and chorus is him talking to his baby. Hey, if you can't talk, cry because we'll talk for the rest of our lives. And God does give us that gift. It's so cool. And actually I didn't have any lyrics. I had a little musical progression for the bridge and didn't have any musical progression at all. Mark can actually tell you the story about the bridge. JFH (John): Well I'll change the subject for you. What inspired "Don't Give Up?" Matt: "Don't Give Up" is about divorce. We have friends who... Well it's a new phase in life for us. First phase is getting married and all your friends getting married and all happy. It's like the second phase is, "Aww, everybody's having kids" and also there's the wake up call, "Oh, you're getting divorced." It's the first time and twice this year we've experienced that with a friend. Really close friends. And so, for us, we didn't really think there was a really good reason for it, you know? (Amy: Do they have children?) No, luckily. Really, we're thankful there weren't kids involved. It was really just a case of, "I don't know if I ever really loved you and we're having problems, so I'm just gonna give up." Believers, people who made a vow before God to death do us part. And we all heard them say, "For better or for worse." It was an odd process of having to talk to our friends about it. "You know you said, 'For better or for worse' before God. Why is it so easy for you now to just run away?" "Well I don't know what to tell you." It's a really strange time in our lives to deal with that with a friend. So "Don't Give Up" is a letter that we wrote to our friend and it's hopefully also a letter to all people who are considering going through divorce. Also, hopefully it's a song that people will hear who aren't married and it will cause them to really give some serious thought to the seriousness of marriage. I just want people to know that you don't have to give up. When your heart becomes restless and you wanna move on, that's not love. That's not real love. Real love is a choice and the commitment to make it work. Especially as followers of Christ, I think that when we see the way that Jesus loves us unconditionally and that he would literally give everything for our good not for His own good. We have that duty as believers, especially in a marriage, first to our family to lay our own needs and desires down to do whatever it takes to serve the people closest to us. And that's where it starts. That's what that song is about. We hope that people will in some way... There's people that will listen to that song and don't throw it away, don't throw their marriage away. (John: Sometimes I'll look at your songs and they don't hit you right away. Then I figured out that that was what it was about. I have acquaintances I know that have gotten divorces recently and it hits me because now I'm married and it's a different thing than when you're a teen and people are getting divorced and it's serious, but you don't understand it as much as when you're married. You have people you care about and you think that things are good and then all of a sudden... And you don't know the story behind everything that goes on with their relationships but it's serious when they're giving up...) That's another thing from stage that we really try to talk about. Since we talk about all these things as a band and how sometimes we don't give up. How do I wanna present that? If you're talking with the guys we really wanna be sure to mention too that we understand that it's not our job to judge people's hearts or what happens behind closed doors because you really can't know both sides of the story. Only God sees that and I do understand that in some situations; abuse and adultery and what-not there are reasons for divorce and I understand that too. I don't want people to feel judged, even when writing the song we want to be careful because we don't want people in those situations to feel judged by the song who have already been hurt. But we want it to be a clear message to people that have no good reason to, but are really just letting go or take an easy route. JFH (John): How did working with producer Chris Stephens affect the sound on your new record? Chris: Working with Chris Stephens was probably the most pleasurable experience, as far as making a record goes, that we ever had. And the reason why was because he's probably the most musical director we worked with. He's an all-around great musician and talented piano player. Heavily influenced by funk music and music with a good groove to it. He's got a really good sensibility about melodies and lyric structure. He just really helped us because when we went in the studio. We didn't have things completed to just be able to lay it down on tape and say that's the song. We had a lot of work to work through as a band and arrange. So working with him, he just poured his heart into it. I was just talking to our A&R guy today and we had both agreed that we really feel so strong about this record because Chris poured everything he had into it. He didn't have anything else going when we were there that distracted him from being with us full time, and vice versa. We knew we had to give it all we had, too. So we're really happy with the outcome of it and we hope to work with him again soon. I think we're actually gonna be recording a Christmas song with him coming up this summer for later this year. It's definitely a great relationship made there. Now we're great friends with him. We're gonna probably hang out with him this week. If anything, we got a really good friendship out of it. (John: What project is the Christmas song for?) I don't know the name of it. I don't know what it's gonna be. One of those compilations that'll be out. You'll probably hear about it soon. JFH (John): What do you hope that listeners will get most from listening to The Face of Love? Matt: A ride. *laugher* Just kidding. I think front to back I hope people feel the authenticity of our struggles. But I hope they equally feel the authenticity of the hope that we carry and the hope that we share as believers in Christ. It's hard to mesh the two together, you know? Because some people are just real optimists and some people are just real pessimists. It's like bringing those worlds together and trying to shed true light on struggles and true light on hope. It's kind of hard to tie together sometimes. But that people would allow their struggles to really mold them and lead them in the direction that God has for them, because that's God's promise to us. He can take the worst of the worst and turn it into the best of the best somehow for us because it brings us closer to what He has for our lives - whether it was something he caused to happen or just because this world is evil. Bad things happen that I don't think He really intended but He promises to take those things and work them for our good. As believers, we can have that hope and I hope people just keep pushing through and learning how to be honest and communicate about these things and find the healing that happens and just open up and talk very candidly about both sides of life. I hope that makes sense. JFH (John): How has fatherhood changed and affected road life? Matt: I'll answer this one first because I just had a baby five weeks ago. (John: Congratulations. I heard about that.) Thank you, I appreciate that. I just felt really stupid because last night we had a radio dinner and Peter York was there and I hadn't seen Peter since we had our baby and he asked me how my daughter was and I actually started crying a little bit and I felt really dumb. But man it is really hard. (Amy: What is her name?) Emerson Mae. I never knew... I never understood that your heart could love that kind of way and you always hear it from people. You're hearing it from me now but you won't know until you have children. I didn't know until I had a daughter. So it makes it a lot harder but I also hope that in the long run that she'll be able to see that her dad was doing something that has eternal rewards and values and I hope that affects her life in a postive way in the future that she can see why we do what we do. I think it's all worth it when we get to Heaven and God says, "Well done, you're doing it for the right reasons." It's still hard. (Amy: Do you think that you'll take them on the road with you?) Man, once we get a bus, which we hope to in the next year or two, we really would like to bring our families more. We brought our wives an awful lot. (Amy: I remember you having your wives but now with children it's gotta be hard to.) Yeah it is. I think we have hopes to like, just for short weekends to bring the kids. As much as we can slip them on the bus once we get it, but for now in the van, it's really hard. Matt: It does. It makes you really want to work harder, cause then why are you on the road if you can't make use of that time. It's when you get home and you don't have to think about it. JFH (John): And Dan you're a newlywed? Dan Gartley: Yup. (John: Congratulations.) Thank you. (John: How has that affected your life on the road?) Well so far, we got married and then Matt had Emmy and we had a month off, so we got to be together which was great. And last week me and Pete flew up to Toledo and that was the first week of being away. Leaving was hard and we missed each other the whole time and then coming back home was great in a new way. Greater than it was before we were married, if that makes sense. We haven't been away too much yet so far. We're about to leave on Friday to go back on tour for a month so that's gonna be a new ballgame I guess. She's gonna fly out for part of it and spend a few days kind of in the middle of it. I guess we'll find out here more in a few days. JFH (John): And you got married last year right? Chris: Last June. (Amy: What was your date?) June 11. (Amy: That's my birthday!) Really? Mine's the 16th. We had my birthday on our honeymoon. That was great. It was a good month. Pete: I still don't own one. Mark: Does she actually use it? (John: Oh yeah.) See I bought my wife one of the mini iPOD's, the green one. I think I've seen her use that thing twice ever. Matt: I got my wife a Nano and she uses it sometimes but not nearly as much as I'd like to see her use it. Matt: Well the ongoing lesson that I'm learning and the more I'm talking about it the more I'm challenged to live it out. It is "The Face of Love." It really revolves around servanthood. And it's really about everyday servanthood. Especially in your attitude, you know? Just the idea of being humble and flexible and willing to work under other people's terms and do what other people need. And try not to get in the way. Try to just be used in whatever little ways through my attitude and my hardest. Just to be able to help the needs of other people and just not really my own. So I think that's kind of a big theme in this record and that's really what the song is about too. We're really trying to talk more about that because we still really believe in that the fact that through all the struggles we went through, it's the fact that Christ shares in our sufferings, even really serves us in our sufferings. He puts our needs ahead of His own. He could be like, "I'm God, just look out for yourself." But He doesn't do that. So I figure, as followers of Christ, that's how we are His face. But everyday, man, it's little attitude adjustments to get ourselves out of the way and let Him be glorified. Chris: I think lately I've just been encouraged with all the changes that's happened to all these guys having kids and having kids grow up. Getting new members - Pete and Dan - and just how cool it is to look at this band as a unit and really see God's hand on it. I feel really priviledged to be a part of it everyday. I've been learning how awesome it is to get to make music with your good friends and be on the road and get to go out and do something you really believe in. You get to go out and share with people. Not to take it lightly but try to get better and perform better and just do it to the best that you can. 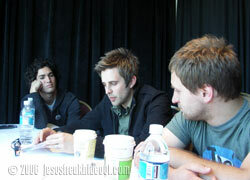 Mark: I think I've been learning more about God's love and His grace and His mercy and just how deep that really goes. I think, up until this year, I didn't realize how much I struggled with almost like a "works" mentality. If I had "x amount hours of day" and I read my Bible "x amount hours of the day" then God will give me everything I've ever wanted. I think I'd really get blessed and it's not necessarily true that way. God will bless who He wants to bless and He'll keep you where you're at as long as He wants to keep you where you are at. I think a lot of misunderstandings have been lifted away. Even being a part of the Christian music industry, meeting a lot of people who are getting apparently blessed or whatever, and realizing there's nothing that they did that made God want to do that for them. Just learning how much it really is just simply God just does what He wants to do. Our goal really is to line up with that and get our hearts to be in a place of, "God, let your will be done." And that's just all there is to it. So I've been learning the old cliche, "There's nothing you can't do to make God love you more and there's nothing you can do to make Him love you less," and the fact that really is true.